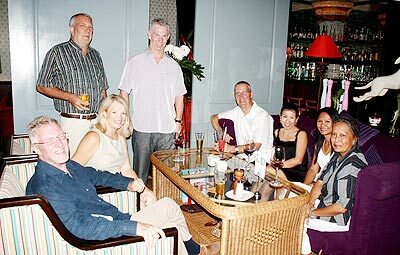 Phitsanu Thepthong, (2nd right), editor of Chiang Mai Mail, with his marketing team, Suthasinee Maneekul, (right), and Chuthathip Mahaphaisan, (left), pictured introducing themselves to the GM of the Imperial Mae Ping Hotel, Praphan Kodpet, (3rd left), and Phatcharida Manonam, (2nd left). 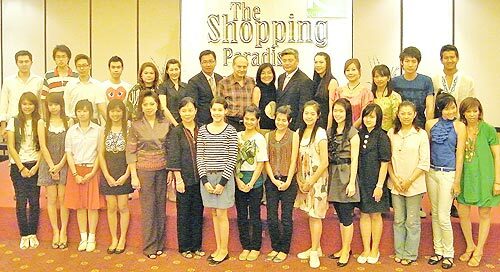 A grand charity fashion show to take place at Robinsons’ Airport Plaza from July 4-8 was announced recently at a press conference at the Maninarakorn Hotel. Movie and TV stars, Hi-So personalities, and 30 ‘young celebrity’ girls will take part. 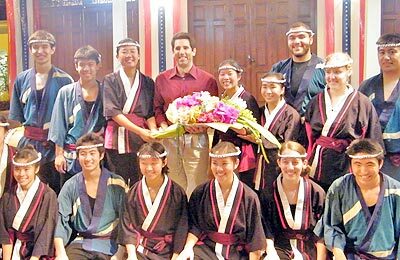 US Consul General Michael Morrow, (4th left), presents a bouquet of flowers in thanks to members of the Stanford University Taiko Drummers, after their wonderful performance at Chiang Mai’s US Consulate-General on June 24. 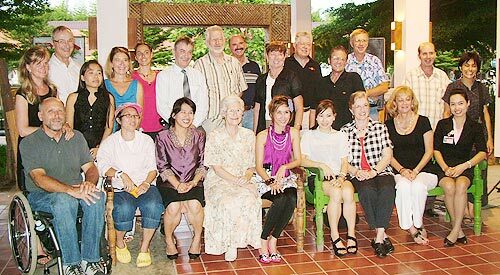 Chiang Mai Friends Group meets at JJ Markets for comradeship, integration and information. Ginger Restaurant was the chosen venue on June 17 for a birthday party and dinner hosted by Malcolm Tetley for his girlfriend and partner, Timmy. Pictured are (l-r back), Tony, Margaret, Nest and David, with Malcolm, Timmy, Earn and Siripan, (l-r front). New arrivals from Washington D.C., Debbie and Michael Goss, were recently introduced to new friends at the home of Becky Lomax and Frank Weicks. Also welcomed back were the FERC representative to the USA, Steve Deering, and his wife Sheila, together with Dr. Dan Pittman of Georgia here for a long visit. Delicious southern Louisiana cuisine was served, topped off with bread pudding and rum sauce! 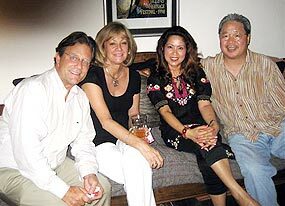 Pictured l-r are Michael and Debbie Goss with On and Jimmy Tse.